Speaking in Parliament on 1 Apr, Minister for Law and Home Affairs K Shanmugam said that the new Law against Online Falsehoods will not stifle free speech as it deals with statements of fact and not with opinions. According to the report by Straits Times, it was revealed that Singapore is among 20 countries that have either implemented laws or are considering to implement such laws to tackle the problem of fake news. “I will say we are behind the curve in the sense that there are a lot of falsehoods being propagated”. However, the Minister said that one is still free to have “whatever viewpoints, however reasonable or unreasonable” as the proposed legislation “doesn’t deal with viewpoints”. Giving his support to the new legislation was Senior Minister of State Edwin Tong, who said at a SMU forum on Wednesday (3 Apr) that the new bill was a “question of national interest and public interest that is at stake”. Speaking at an election rally at Nee Soon in 2015, former Worker’s Party chief Low This Khiang said that the PAP was “as tame as a cat” during elections but would become a “lion with its mouth wide open” once elections were over. Low pointed out that the PAP had said in 2006 that it was not going to raise the Goods and Services Tax (GST) which was at 5% then, but then had decided to raise the GST to 7% the following year after winning 66.6% of the total votes. “When PAP gets an overwhelming majority of seats, it will take it that you agree with its actions. After the 2011 elections, the PAP didn’t raise the GST. After this election, I’m not sure”. Subsequently, PM Lee Hsien Loong came out to rebut Low’s claims by saying that the PAP government would be “mad” to raise the GST just because it had garnered a certain percentage of the votes. Barely 2.5 years later, Finance Minister Heng Swee Keat announced in his Budget 2018 speech that the GST rate will eventually be raised to 9%. He said that the decision was to help fund expenditure in areas like healthcare, security and other social spending. Such increases in these areas will be recurrent and would benefit Singaporeans broadly. After the passage of time, it becomes clear that the Low’s 2015 speech has come true. Yet, had the “fake news” law existed then, his claims would no doubt classified as an instance of “fake news” by a Minister and would be asked to retract his statement. FAKE NEW LEGISLATION is FAKE of its CONSTRUCT. Truths and falsity are ALL MALLEABLE. Let no one deceives us. Otherwise why even non-political academic resists and PAPpys STRIDENTLY resists putting that exemption in text of statutory law proposed? PAPpypolitics is tell me that the sun rises from the west and set in the east. My response to them? LET ME WAKE UP TOMORROW TO SEE IF REALLY DOES!! spending on non essential huge infrastructure projects , rather than “in areas that will be recurrent and would benefit Singaporeans broadly”. no end to sgs tightening our belts. worse jobs and SG “Citizenship are given out so easily. our gov has become a sick joke. THE *PAPple* WHO MAKE THE FAKE NEWS law are the MOST FAKE OF sgs there are,can they say not? you get PAP MPs who dont attend parliament sessions or doze off during sessions and only COME AND VOTE OR WAKE UP TO VOTE FOR A BILL? IS THIS NOT FAKE PARLIAMENT N FAKE BILLS? I propose that should ANY MP absent himself/herself from parliamentary debates on a REGULAR BASIS,THEY SHOULD NOT BE ALLOWED TO VOTE AT ALL! I think,if WE HAVE PARLIAMENTARY *KPI*,WP MPs would score MUCH HIGHER THAN ALL THE PAP MPs combined??? so,WHO ARE FAKE MPs drawing top salaries?? ?…plus HIGH PENSIONS THAT EAT INTO OUR RESERVES???? Ministers are supposed to be the final arbiter of what should be considered “fake news”. But if the “fake news” involves them are they not in a conflict situation to decide on the issue? It will be “oneself check ownself” (or the accused is also the judge). This is ludicrous. BTW, Dr Tun Mahathir said the Malaysian Government trust Malaysians so fake new legislation was repealed. Does PAP trust Singaporeans? If it does not then Singaporeans should not trust the PAP because trust is a two-way street, i.e., “trust to be trusted”. It is that simple. Fake news is subjective – as well as is history. Both are written by the victors. A prediction or forecast is not a fake news. Otherwise, some minister will have to declare the Bible and other religious texts as “fake news” publications, AND demand that changes be made to the Bible. It is those in power that we need to guard against. We have witnessed how Russia manipulated politics in Ukraine and US. How N Korea brain wash their citizens with their version of news and reports. In all likelihood, the greatest perpetrator of fake news and half truth will be the govt to gain political mileage. The new bill has to guard again govt officials abusing their power. But the WEAKEST LINK IS THE PEOPLE. 99% FOOLS. 1% CONTROLS THEM. Weakest People Power in all first worlds is Singaporean people power. If Christians says Jesus is God (or son of god), Muslims say Allah is only god, Buddhists say Buddha is God. Then which one is fake. Can’t the relevant minister from relevant ministry please stop the spread of fake news/fake gods? fake teachings? So if the government cannot stop these fake religious teachings and ask us to exercise tolerance and maintain religious harmony, why can’t they also exercise tolerance and accept different political views? Why can’t they stop harassing opposition by suing, jailing, bankrupting them? Instead, they should engage the opposition in real debate with all facts and figures to proof the opposition wrong with total transparency. After that then sue, jail and bankrupt if they loose the debate. Then the opposition got nothing to say. If government just use fake news law to shut opposition up then they must have something to hide. insider information. says police force personnel told cannot take leave in June. something big in June. Election. opposition please be ready. OI OI OI, YOU MUST BE A RETARDED, go back to the kindergarten for morons. My refutations of anti-fake news legislation is NOT. oxygen: FAKE NEW LEGISLATION is FAKE of its CONSTRUCT. Truths and falsity are ALL MALLEABLE. ILLUMINATES PROFOUND MONUMENTAL EVIDENTIARY PROBLEMS INSURMOUNTABLE in the judiciary when confronted with division of truths and falsity. Give you another example. Paikar says CPF is not your money. Then Manpower Minister Tan Chuan Jin said the opposite. Yet Shanmugam says truth is not malleable. PLEASE RESOLVE THIS RIDDLE OF WINDY HAPPY CONTRADICTION OF CONFLICTING EVIDENTIARY PROBLEMS. POFMA PROPOSED LEGISLATION IS A SCAM. It will punish honest non-offender to conceal the lies and deceptions of this legislative creators. Why and where is the proof? Please read the contents of my comments in this thread below in relation to John Thain/Ken Lewis saga in that infamous Bank of America Merrill Lynch takeover case history. For example, GRC is intended to protect minority representation BUT THE APPEAL COURT HAS RULED THAT REPRESENTATION EXPIRED ON ELECTION VICTORY – once past election outcome, minority representation counts for nothing i.e. it is a legislative fiction manufactured in Parliament. Are voters thinking stupidly otherwise are just legal fools or were they misled and deceived? Or is both truth and falsity MALLEABLE in fact and in law? I LEAVE TRE READERS TO FIGURE THIS RIDDLE OUT FOR THEMSELVES. the difference btw a comment and a featured article. wondered why your writings are not a fixture on TRE? its the bombastic english of yours lah. just look at your last sentence…laugh die people la. showing off your vocabulary ah? hahahaha! and btw the readers in TRE are not blind, no need to type in CAPS lah. hahaha! bombastic english plus CAPS. : the difference btw a comment and a featured article. and to make it even more painful, people will not understand what he is writing. will the man be thankful for the constructive critique? hahahaha! So Buddha is God to Hinduism. And just a prophet to Muslim. Can the relevant ministry determine who is spreading fake teachings? If the PAP government think that the minister is a ‘know it all’, then show and do it. And if the PAP government cannot even do this, then stop being a fake ‘know it all’ and faking the ‘fake news law’. 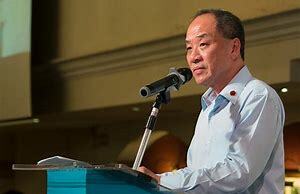 SHORT-SIGHTED THINKING, Dr. Chan is right of social media discourse participation. PAPpypolitics have been feeding peasant Ah Sengs for decades with 1% truth, 99% lies, fantasy and propaganda – CPF, HDB, GRC etc etc. We don’t want this to continue to the detriment of Sinkieland. We don’t want LEE-jiapore to sink and perpetuate into the political decay in the White House of TRUMP POLITICS. Trump boy claims – NO COLLUSION, NO OBSTRUCTION. Details of the Mueller report revealed that he is a serial liar and meddling. The Age: Mueller’s report largely vindicates the work of media outlets that Trump regularly derides as “fake news”………… We already knew that Trump was pursuing a major construction project in Russia until well into the 2016 election campaign despite denials at the time. We knew that Trump lied about the real reason for a famous 2016 Trump Tower meeting involving his son and a Russian lawyer…..We knew that Trump tried to pressure FBI Director James Comey to drop an investigation into his former national security adviser, and we knew he asked White House counsel Don McGahn to help fire Mueller. WHEN TRUMP BOASTED OXONERATION of his “no collusion no obstruction” hypocritical innocence, he must know the Mueller report totally discredited Kellyanne Conway fake depiction of “alternative fact” is nothing BUT ACTUALLY FAKE NEWS FABRICATIONS cooked up in the Trump campaign and in the currency of his presidency. Both he and Kellyanne Conway must know too that corruption, corrupt conduct, collusion and obstruction of public discovery of otherwise truthful accounting are ALL NECESSARILY BORN IN THE CONCEALMENT OF DARKNESS OF SCHEMING AND ONE-SIDED DISTORTION OF TRUTHS. That is why the establishment world-wide is terrified of the social media – they tell all as it is. THE LIE PERVADING ESTABLISHMENTS also know this – it takes a MOUNTAIN of CONTINUIING LIES like CPF, HDB etc to cover a rotten lie but ONCE THE FANTASY AND FICTION IN DCEPTION ARE EXPOSED, they know that they can’t lit a match under the pile of rubbish to incinerate it all into ashes of no happenings. Establishments are only keen on extinguishing “fake news” (truthful revelations from the social media) ONLY AFTER THEY WERE CAUGHT FABRICATING AND DISSEMINATING FAKE NEWS and/or their own fabrication of fake news poisoning of the peasants Ah Sengs’ mind have lost the potency of its toxicity. WHY ARE THEY NOT KEEN OF DESTROYING FAKE NEWS BEFORE THE IMPLOSION OF THE SOCIAL MEDIA?? SELF-INTEREST PRESERVATION OF THEIR OWN LONGEVITY AND HEGEMONY!!! I do hope to see wp get destroyed. I say so knowing it’s politically incorrect to say so in the alternative political sphere. But it is really done very very little. It’s a LAUGHING STOCK. I HOPE AND PRAY IT GETS DESTROYED. ALL GO TO JAIL. LEE-jiapore WANTS TO BE A GLOBAL ARBITRATION CENTRE but also wants to invent and cultivate this kind of PARIAH LAND POFMA law? No windy happy contradictions here? ?